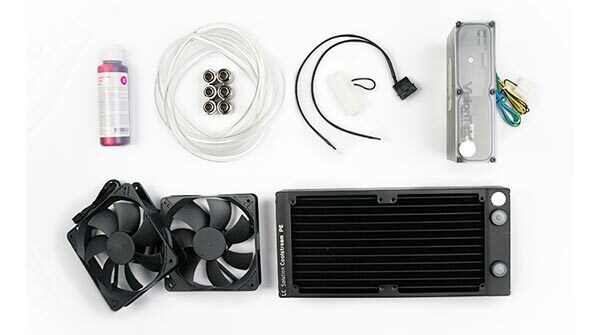 VisionTek, a maker of upgrades and accessories for PC and Mac systems, has launched a new extensive range of CryoVenom liquid cooled graphics cards, liquid cooling bundles and kits. All of the new offerings utilise a custom-made 5.25-inch drive bay fitted pump/reservoir system. Also all of the products were developed in conjunction with EKWB and are based upon, or intended for use with, VisionTek AMD Radeon R9 290 or Radeon R9 25X2 graphics cards. VisionTek's solutions allow for both improved cooling and reduced card width, for instance a 295X2 uses up just the space of one PCIe slot using the CryoVenom Liquid Cooling Kit. 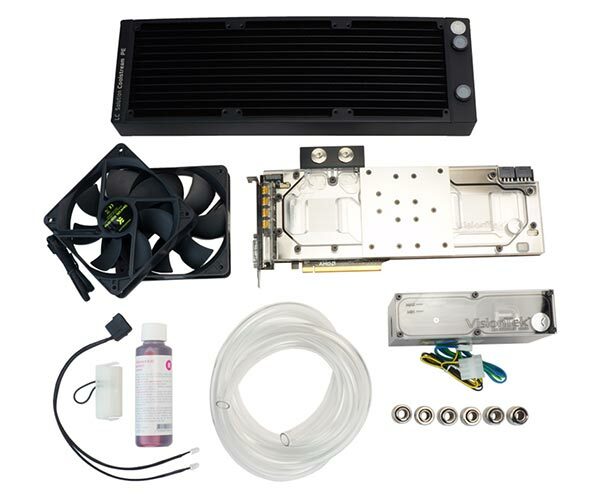 Starting at the cheapest end of the spectrum VisionTek offers the CryoVenom 240 Liquid Cooling Kit costing $299. We are told that "this innovative kit still lets you build your own system, but eliminates the time and hassle required to source your own components, solves the dilemma of pump and reservoir installation location, and satisfies any warranty concerns." Like all the newly launched CryoVenom cooling systems this kit offers the custom-made 5.25-inch drive bay sized pump/reservoir system and a radiator (240mm in this case). This system is capable of 1000L/h flow rate. You can control the pump speed via BIOS or a fan controller and it is said to be ultra quiet and built for long-term reliability. At the other end of the spectrum of new offerings VisionTek's CryoVenom R9 295X2Card & 360 Cooling Kit retails at $2,025. As mentioned above, using a Radeon 295X2 with a CryoVenom Liquid Cooling Kit makes it both cooler, thanks to the better airflow around the cards and the liquid cooling functionality with the added benefit that it occupies just one precious PCIe slot. The CryoVenom system also cools the card's VRM and memory components. So these high end kits and bundles might sound expensive but standard market prices for stock R9 295X2 graphics cards range from $1500-$1950 anyway in the US, says VisionTek. Also these VisionTek built models have been hand-assembled by the company and offer full warranties, the company says that if you use its own cards and kits/components in a DIY fashion those also are also warranty covered.